Attention all competitive boys soccer player's born 2004. Our Scarborough Blizzard elite soccer program is growing. We are looking for competitive and ambitious soccer players who want to work hard and succeed. Our 2004 boys Gold and Silver teams recently finished first in both of their respective divisions. We are all about development, hard work and nurturing player's enthusiasm for the sport. We let the results take care of themselves. 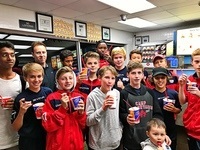 Scarborough Blizzard U13Boys, "WIN IT ALL"
Congratulations to our U13Boys. The Gold and Silver teams both won their respective championships, going undefeated in doing so. Please contact Chris Jurtovski (chrisjurtovski@gmail.com) 647-821-2747 or Ryan Lam ryan.lam@tcdsb.org 416-569-9912 for more detail. NORTH CANTON, Ohio) - The Walsh University women's soccer program is welcoming eight newcomers for the upcoming 2016 season as announced by Head Coach David Renard. The Cavaliers add Caitlin Branthwaite, Alisha Himes, Siobhan LaPierre, Patty Lamanna, Mickey McClanahan, Alexis Meffert, Rachel Repasky, and Brianna Sanborn. "We're excited to welcome a great group of kids to our team in 2016," said Coach Renard who is in his fifth season as head coach of the Cavaliers. "Our coaching staff did a great job of filling some immediate needs as well as improving our depth. It is always our primary goal to attract the best players in Stark County and the Greater Cleveland area and I am confident we brought in some of the best. "For the third year in a row, we've been lucky to bring in top talent from Southern Ohio as well as international players that will have a big impact on our program. This class puts us in a good position to succeed this season in the GLIAC and into the future." Branthwaite is a 5-6 forward from Scarborough, Ontario, Canada who attends R.H. King Academy. She has played club soccer for the Scarborough Blizzard and Toronto Skillz. She was named Female Athlete of the Year three times at R.H King Academy in Toronto. She played striker for Jets SC and Scarborough Blizzard over the past four years where she recorded 39 goals and 15 assists in 2015. Her club team won the prestigious Disney International Cup in 2014. Branthwaite was a member of the R.H. King Leadership Program. Congratulations to the 1998 Girls for winning the Disney International Cup Tournament that took place in Disney World, Florida. Way to go JETS!!!! Congratulations to the 1998 Girls team for winning the Richmond Hill Tournament this weekend. Way to go JETS!! !